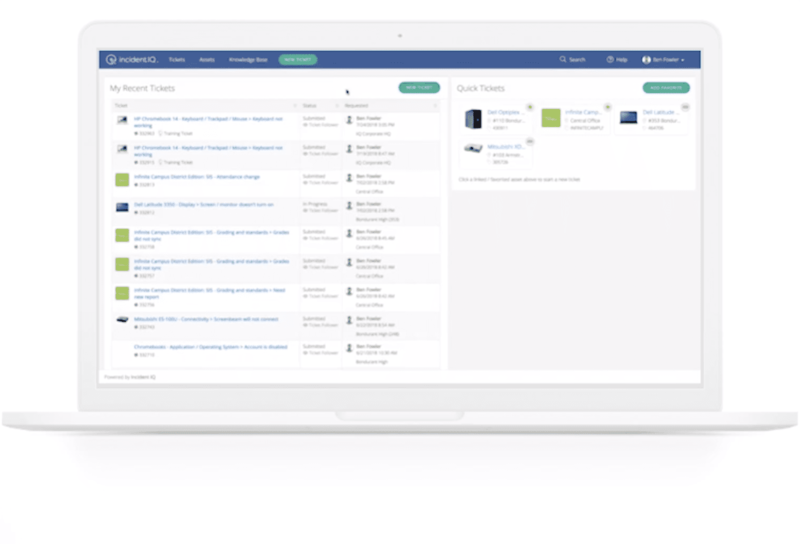 Our Winter 2019 Release has a variety of new features and improvements that allow you to get the most out of Incident IQ. Check out some of the new features below. We’ve streamlined how to stay informed on the tickets that matter to you most. 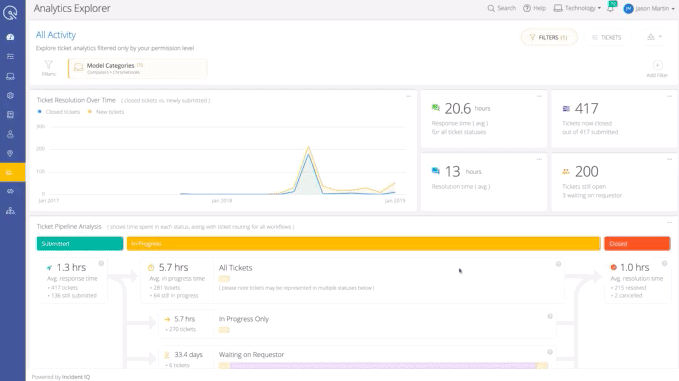 Notification Center collects the changes to relevant tickets in one convenient place. Users need to drill down into their data, and we’ve made it easier than ever before to find exactly what you’re looking for. 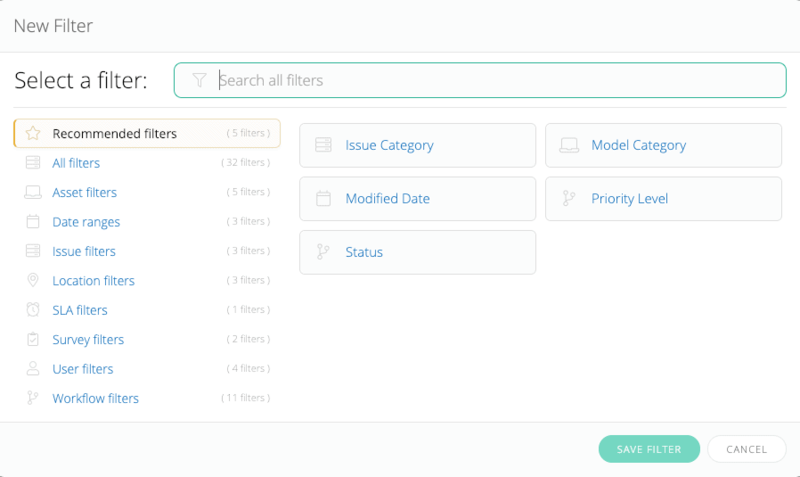 Our overhauled filtering engine features an entirely new interface, as well as dozens of new filters. These new filters are enabled in ticket, asset, and user listings, as well as Rules Engine. You’ll notice a new look and feel to our search engine, but we’ve also done a lot of under-the-hood work to ensure that search results are even more relevant than before. 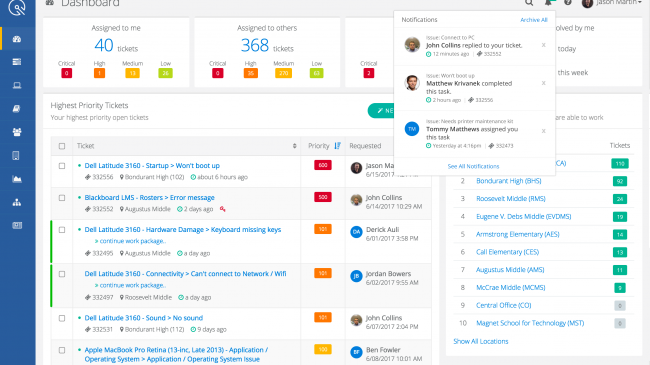 Results are now broken down by type, allowing users to quickly locate exactly what they’re looking for. The Incident IQ Analytics Explorer has been enhanced, with greatly reduced refresh time, deeper drill-down options, as well as a greater ability to display SLA responsiveness related to teams and locations. Rules Engine enhancements: The new filter enhancements also factor into our new Rules Engine enhancements, allowing rules to be triggered by a host of new variables. Use the new Location Assignment action to set common routing and assignment criteria using just a single rule. The new Rule Simulator lets administrators see what impact a rule will have, prior to activation. Keyboard shortcuts: Quickly navigate Incident IQ using our new set of handy keyboard shortcuts. Export Wizard: Unlimited export size, and the ability to select precisely what data points are included in ticket and asset exports. Announcements app: A new app that allows you to quickly push announcements to all Incident IQ users in your district. Ticket Templates updates: Ticket templates are now more easily accessible, and shareable with other users. Using bulk actions, apply ticket templates to multiple assets at once. Google Device Data: Automatically generate new assets in Incident IQ when devices are added in Google Admin Console. Instantly assign ownership of a device in Incident IQ when a user logs in to a Chromebook device. Allow writeback permissions to permit changes made in Incident IQ to be reflected within Google Admin Console. Microsoft SCCM Devices: Automatically generate new assets in Incident IQ when devices are added in Microsoft SCCM. Instantly assign ownership of a device in Incident IQ when a user logs in to a Windows device. Allow writeback permissions to permit changes made in Incident IQ to be reflected within Microsoft SCCM.